The gorgeous greens of Brick Landing golf course are set amongst salt marshes and Intracoastal Waterway of North Carolina, minutes from the South Carolina line. Dan Maples designed this Par 72 course, home to 18 holes featuring over 6,700 feet of greens from the longest tees. Beautiful course greens are perfect. Very unique lay out!!! When I checked in I was told that the course was in the best shape it had ever been in. I've played it a few times over the years and was very disappointed on it's condition the last time. Greens we're redone earlier this year so I was looking forward to the "new" layout. I was disappointed. I understand it is early and the Bermuda rough isn't in, but the non fairway areas, especially around the greens, were bad. Sand traps were washed out onto adjacent areas and had been that way for a long time. Cart paths were disintegrating and pieces of asphalt were everywhere. Whole green and good to hit off of, there was something along to moss mixed in. Some greens were worn at the edges and fairly slow. Not particularly long from either the ladies or men's white tees.We won't be back. We went to dinner friday night, which was absolutely amazing and the live music was a great addition! The atmosphere was happy and relaxing, the staff was perfect and the food was to die for! I love the live music addition you have added and will tell all of my friends and family to make reservations! Great family friendly place and will definitely be back! Our visit here was very poor. How it got 5 stars on Google I don't know. We went on a Friday night around 7pm. We sat in the dining room where there was one other table of diners. All the others were in the bar area where there was live music. Our server seemed less than interested in us and took a very long time to return after each time we ordered or asked for something. The prime rib was the special and it was very tough. We were hungry and tired and not up for asking for a different entree since the service had not been great. Just did Sunday Brunch. Everything was cooked to perfection. Wonderful staff and the Chef came out and greeted us after we ate. Six different meals and all we're perfect. We will be back. Service and food are all top-notched. Also, they have a friendly and professional staffs that are good at entertaining customers. Highly recommended. The centerpiece of Brick Landing Plantation community is the 18-hole championship golf course known by locals as “The Brick”. The Brick is considered by many to be one of the area’s finest layouts and is a challenge for players of all levels of ability. The layout of the golf course takes full advantage of the terrain’s natural beauty as it weaves throughout the marshes and Intracoastal waterway. 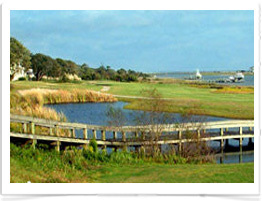 You’ll encounter a wide variety of wildlife, natural vegetation, saltwater marshes and hardwood forests which are home to historic oak trees as you play your way around the course, which itself winds through the plantation golf community, The two things that many golfers remember most about their round at Brick Landing Plantation are the fairways and the greens. The fairways have a lot of roll to them and the occasional uneven lie is not an odd occurrence. They are well maintained and manicured and lead to Sunday Bermuda grass greens that produce consistently true rolls. The breeze that drifts in off the ocean is quite refreshing on those hot, summer days and can sometimes wreak havoc with your game. Most Memorable Hole: Number 4: Par 4, 289 yards. If I were naming holes, this one would be called “Shotmaker.” A long iron or hybrid is all you need off the tee. Just be sure to hit it straight; there’s water on either side of the fairway. A good tee shot will leave a short iron or wedge back over water to a green protected by water in front and on the right. You’ll need two well-placed shots to have a chance at par or better. Before your round (or after if you had a rough day) be sure to hit some balls on the driving range. Brick Landing Plantation has an outstanding practice facility located across the street from the pro shop. In addition to a full-length driving range where you can hit every club in the bag, there’s a short game area as well as a large practice green. The Pro Shop at Brick Landing Plantation offers golfers some of the best equipment and apparel choices in the area, all designed to complement your game. They also have a wide selection of golf balls from all of your favorite manufacturers. Outside of golf, Brick Landing is known as an outstanding wedding venue. The event staff will take care of all of the elements on your dream day and let you focus on your guests. The Intracoastal Waterway offers a beautiful view while Ocean Isle Beach serves as a stunning backdrop; it’s a view unrivaled on the Carolina coast. All weddings are catered by ART Catering & Events. The View Restaurant stands in a league of its own. Locals and visitors alike routinely visit The View to enjoy fresh seafood and exciting American traditional dishes with a focus on fresh and local cuisine. Be sure to check out their famous Sunday Brunch too. Brick Landing Plantation offers a membership plan that will fit both your needs and your budget. These memberships offer such privileges as preferential tee times, member only events and discounts in the pro shop as well as the locally famous The View Restaurant. Brick Landing offers Full, Social, Seasonal and Pay as You Play memberships. Full memberships offer the best value and include no daily golf fees, free range balls, a $30 guest rate, a Platinum Card and discounts in both the restaurant and pro shop. You’ll also get a personalized locker (based on availability). A Membership brochure is available on their website. Last Word: At 6,576 yards, Brick Landing Plantation isn’t going to overwhelm a long ball hitter, but, at the same time, it’s not going to play to their strengths either. Several par 4s measure less than 350 yards, which will probably take driver out of their hands. On several of these holes, water dictates the shot and shape you need to hit off the tee; it’s more about shot placement and distance control than brute strength. There are a few holes where hitting the ball a long way off the tee can help, most notably on Number 17. At 444 yards from the White Tees, most double-digit handicappers will consider a bogey a good score. Excellent service. The food is very good! Fresh, tasty, a nice variety on the menu! Great views of the water too! Delicious brunch. Cinnamon rolls deserve 10 stars ! At dinner tonight, food was mediocre. Four of us and only one had a decent meal. Service was very slow and an appetizer we ordered never did arrive. Ambience non existent. On the plus side, decent music and a very friendly, gracious waitress. If there was an option to post a 0 star I would... The greens are horrific. They are black with little to no grass and they don't try to hide it at all. Tee boxes are all sand, fairways are okay. Bunkers aren't raked. Doesn't look like the course is managed at all. Not even worth the low price of $35. Don't let the pictures fool you, only 2 holes on or by the water. Not worth playing vs. the other options in the area. Looks nice pulling up, but the course is awful. Lacking grass and the greens basically dirt. There were 4 of us playing and we ended up quitting after 9 holes. Pics available on Yelp. Went for a quick 9 holes. Staff were incredibly friendly and engaged us in questions to best fit our outing. We called same day and got a T time. Price was very affordable. The course was very challenging with a lot of waterways. Nature life was beautiful to see as well on the course. Very clean. Some of the greens were in need of attention but they were recently hit with a lot of storms but still very playable. Definitely recommend. The layout was challenging and fun. Definitely need to be accurate as the fairways are tight and the greens are small. 1 and 18 are beautiful holes. Pace of play was a joke. 2 of us took 4 hrs to play because two foursomes wouldn't allow us to play through. The group directly in front of us were seniors and we're driving up on few boxes and almost up to the green. They need a Marshall to check on pace of play. Some of the greens were absolutely horrible. I would never pay $50 to play here when half the greens were in the condition they were in. Played 5/8/18. If the greens would come in then yeah is a possibility but not anytime soon. The gorgeous greens of Brick Landing golf course are set amongst salt marshes and Intracoastal Waterway of North Carolina, minutes from the South Carolina line.